The Florida Center for Inclusive Communities (FCIC) is providing leadership in a variety of local and national research, training, and program development efforts. The following staff leaders provide contributions to the field of employment: Tammy Smith and Brenda Clark. FCIC offers a large array of training and technical assistance in order to build capacity around effective transition and customized employment within the state. The activities described below provides state of the art training and technical assistance to job seekers, families, community rehabilitation providers, school districts, and state agencies involved with employment supports, services, policy development and implementation for people with disabilities. The FCIC employment activities have strong collaborations with the Florida Developmental Disabilities Council, Florida Department of Education/Division of Vocational Rehabilitation, Agency for Persons with Disabilities and Social Security Administration. For more information, contact Brenda Clark at 813-974-2581. 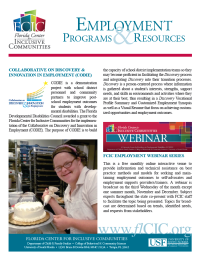 CODIE is funded by the Florida Developmental Disabilities Council to build the capacity of competitively selected school professionals and community action teams to use the Discovery process in supporting youth and adults with disabilities in achieving customized employment. CODIE trains county-based teams, provide technical assistance to teams as to the use the DPG process, and has developed learning collaborative to support teams in achieving optimal transition and employment outcomes for individuals with developmental disabilities (DD). CODIE staff members provide systematic training, mentoring, and ongoing technical assistance to ensure that teams can implement the Discovery process with fidelity to the values, procedures, and intent of the model. For more information, please contact Brenda Clark. Transition Resource Information and Planning (TRIP) sheets are the first of a series to provide students and their families belief that employment is possible for persons with developmental disabilities. These sheets specifically target middle school students so the students and their families can relate to the images and plain language. The sheets give some promising strategies for students and parents to learn as much as possible about the student. 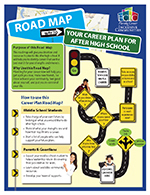 Planning guided by the student interest, preferences and priorities helps to identify careers that are the best match and focuses the students vision for possibilities of life after high school. 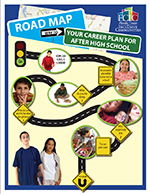 This companion document was designed to reach middle school students who are non-readers. Active family involvement is important for preparing your child beginning at age 10 for life after high school. 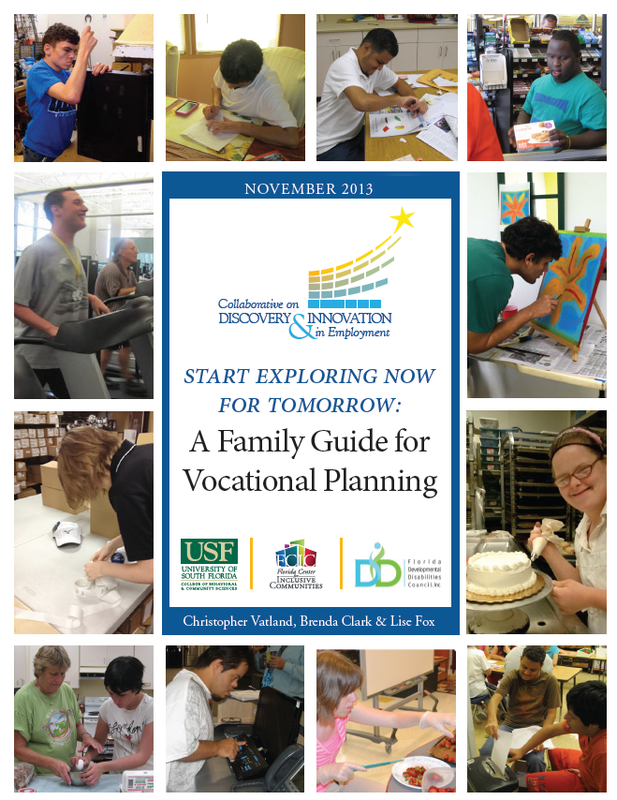 This Family Guide for Vocational Planning includes suggested activities that families can engage in to help children gain skills that will be beneficial in future paid jobs and for independent living. These activities support children to learn more about careers, improve skills related to goals, and better understand their own preference. The guide is rooted in the belief that all children have the ability to find jobs and careers that are not only within the scope of their abilities, but are aligned with their interest, preferences, and priorities which are principles and values of Discovery person centered planning process and customized employment planning. The guide also has a glossary of transition and supported employment terms, and listing of Florida and national resources for navigating transition and employment. Interested in Employment? FCIC has a variety of resources to assist individuals with disabilities to find meaningful employment. Read about FCIC’s employment programs and resources by clicking on the link. This fact sheet provides information about cusomized employment, the Discovery process, and the components needed to make the process sucessful. This fact sheet provides information about customized employment as well as the resources available at FCIC's Center for Self-Employment and other projects. The Florida Center for Inclusive Communities partnered with SSA's Florida Work Incentives Coordinator Marlene Ulisky to develop Everybody Works, Everybody Wins!, a flyer targeted to youth with disabilities and their families. The Florida Department of Education has request that Florida public schools distribute it to students via Individual Educational Plan (IEP) meetings. What Does It Take to Be an Employment Specialist? Many high school students have no idea what they want to do after they graduate. A resource, co-written by teens for teens, helps young people with disabilities to increase possibilities for success into adult community life. Find tips for parents, families, and other caring adults to support and be involved in the success of youth with and without disabilities. ICI's National Report on Employment Services and Outcomes is now available. The book provides national and state level statistics spanning a twenty-year period. Its sources include several data sets that address the status of employment and economic self-sufficiency for individuals with ID/DD. 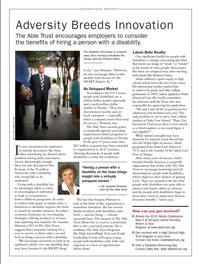 In Adversity Breeds Innovation, The Able Trust encourages employers to consider the benefits of hiring a person with a disability. To establish a starting point that can be used for future analysis of the effectiveness of programs designed to help Floridians with disabilities who want to work, this paper estimates both a state-wide unemployment rate for persons with disabilities in Florida as well as unemployment rates for individual counties, as Florida prepares for its future workforce of jobs needed by 2030. 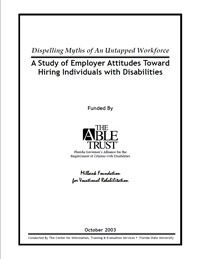 In 2003 The Able Trust partnered with the Milbank Foundation for Vocational Rehabilitation to conduct a study of business employers in Florida concerning their policies, practices, and attitudes related to hiring persons with disabilities. LaunchMyCareerFL.org is a free interactive website that helps students determine their ideal majors and jobs based on programs at public institutions and training programs in Florida. The Florida Department of Economic Opportunity offers CareerSource Centers to help job seekers and employers. Services for job seekers include help with your job search, employability skills training, find a job, recruitment events and much more. Services for employers include posting jobs, employed worker training, and much more. The Florida Abilities Work portal in the Employ Florida Marketplace was created to meet the needs of Florida employers who wish to hire qualified job seekers with disabilities and the job seekers who are trying to find that next great job. Employ Florida Marketplace is the State of Florida's official job search website. The agency supports persons with developmental disabilities in living, learning, and working in their communities. APS provides services to Floridians with autism, cerebral palsy, Down syndrome, intellectual disabilities, Prader-Willi syndrome, and spina bifida. APD also provides assistance in identifying the needs of people with developmental disabilities for supports and services. APD Supported Employment Services: Review of Supported Employment Services offered through the Agency for Persons with Disabilities to their customers. Disability Rights Florida is the designated protection and advocacy system for individuals with disabilities in the State of Florida. Their mission is to advance the quality of life, dignity, equality, self-determination, and freedom of choice of persons with disabilities through collaboration, education, advocacy, as well as legal and legislative strategies. Students with Disabilities : School and Work: This site provides information and resources to assist students in special education and their supports to understand the IDEA federal law, how to apply it and when to apply it to most effectively assist the students with what skills they will need to live in the community and plan for how those skills will be acquired. There are many ideas, services and technologies for people with disabilities and planning can put them within reach. FAAST is a non-profit organization funded by the US Department of Education through the Assistive Technology Act of 2004, Rehabilitation Services Administration (RSA), and the Florida Division of Vocational Rehabilitation. APSE is the only national organization with an exclusive focus on integrated employment and career advancement opportunities for individuals with disabilities. APSE leads in the advancement of equitable employment for people with disabilities. The primary purpose of the Florida Business Leadership Network (FBLN) is to promote diversity policies that include people with disabilities and hiring practices that target candidates with disabilities. The FBLN serves as an information clearinghouse by providing employers with disability employment resources and local FBLN chapters with general information and networking opportunities for sharing best practices. The Developmental Disabilities Council is a non -profit organization that receives federal assistance from the Department of Health and Human Services Administration on Developmental Disabilities. 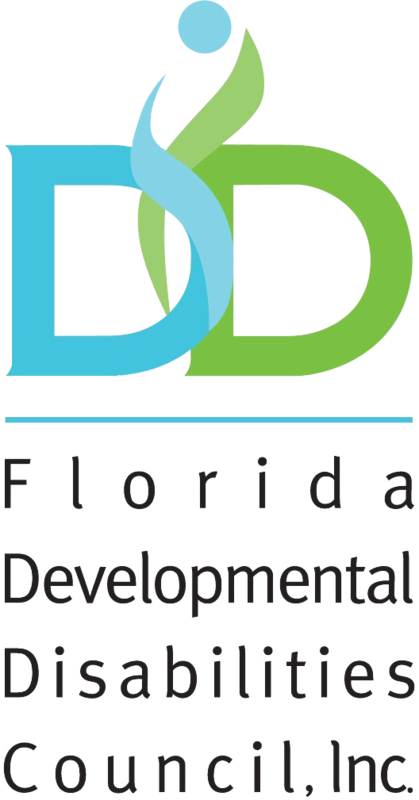 The mission of the Florida Developmental Disabilities Council, Inc., is to advocate and promote meaningful participation in all aspects of life for Floridians with developmental disabilities. Created by the Florida Legislature in 1990 (FS 413.615), the Florida Endowment Foundation for Vocational Rehabilitation, parent organization of The Able Trust, is a 501(c)(3) non-profit public/private partnership. Its mission is to be a key leader in providing Floridians with disabilities successful opportunities for employment. Supported Employment: Supported Employment is a unique employment service for individuals with the most significant disabilities who require ongoing support services to succeed in competitive employment. School-to-Work Transition: The Division of Vocational Rehabilitation’ school-to-work transition supports and services helps students enter training, continue education, and/or work after leaving high school and provides information about what transition services and supports offer, who provides the services, who is eligible for the services, and how to apply for the services. The U.S. Department of Justice provides information about the Americans with Disabilities Act (ADA) through a toll-free ADA Information Line. For general ADA information, answers to specific technical questions, free ADA materials, or information about filing a complaint, call 800-514-0301. Access this webinar: http://usf.adobeconnect.com/financialwellbeing/ Registration is not required. Certificate of attendance awarded upon request. Requestor must attend the entire webinar. For additional information about certificate requests, please contact bclark7@usf.edu. May 15, 2019: Julie Reyes, Founder Executive Director, Diversity Action Coalition, Inc.
June 19, 2019: Marlene Ulisky, Manager, Financial Empowerment & Disability Benefits, National Disability Institute. To receive announcements and learn more about each future webinars subscribe to FCIC Employment email list. View past employment webinars in the Online Trainings section of the FCIC Resource Library. Identify potential jobs that are a match to the job seeker/employee. Help the employee be successful on the job. Address the needs of both the job seeker and the employer. Each module ranges from 15-25 minutes to complete. Many of the modules include a short quiz or learning check to help the participant reflect on what was learned. Certificate of Completion available after successful completion of all modules. Note: The modules must be completed in sequential order. Once you have completed all modules, you will be able to go back to review any of them again. You only need to register with our system once to access any of our FCIC online webinars and modules. 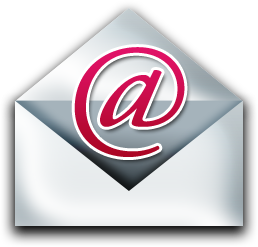 An automated confirmation email will be sent to your email, containing the login link used to view the modules. Add the email address admin@acrobat.com to your email safe-list. Already registered with FCIC's online system? Click on the button below to log in. These modules were sponsored by the United States Department of Health and Human Services, Administration on Developmental Disabilities and the Florida Developmental Disabilities Council, Inc.